For the millions of Americans that suffer from peripheral artery disease (PAD) with claudication (leg pain) especially when walking, angioplasty in combination with a stent may be recommended to increase blood flow to the legs, thereby decreasing the possibility of amputation in more advanced PAD cases. While lifestyle changes that include a cessation of smoking, a healthy diet and exercise are recommended for PAD patients, more intrusive treatments may be advised by your doctor or vascular surgeon if the arterial blockages are preventing you from walking and in more severe cases may cause loss of the limbs. Claudication in PAD patients is the result of insufficient blood flow to the lower leg muscles when exercising, generally because of atherosclerotic changes in the leg arteries so that a section becomes narrowed or blocked. 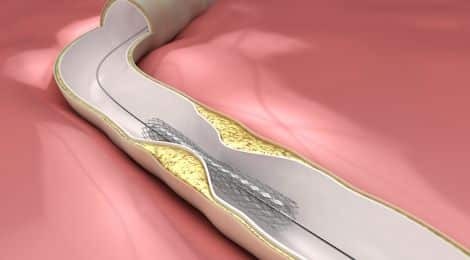 Since there is no widely accepted medication to treat claudication, angioplasty, a minimally-invasive procedure in combination with stenting may be recommended. During an angioplasty and or stent procedure, you will be mildly sedated and given a local anesthetic where the insertion of a small balloon will be used to dilate a narrowed segment of an artery. This procedure usually requires less than a 24-hour hospital stay. A vascular surgeon will begin the procedure by placing a tiny needle into the blood vessel in your groin. A tiny flexible wire will be inserted through this needle. The surgeon will be able to see your artery with live x-ray pictures. Dye will be injected into your body to show blood flow through your arteries making it easier for the surgeon to see the blocked area. Carefully guiding the thin tube through your artery, the surgeon will direct the catheter to the affected area. The vascular surgeon will then push another catheter with a very small balloon on the end over the guide wire, and into the affected area. The balloon is then filled with air, which opens the blocked vessel and restores blood flow to your leg. A stent may also be placed in the blocked area. The stent is inserted at the same time as the balloon catheter. It expands when the balloon is blown up. The stent is left in place to help keep the artery open. Once the stent is placed the balloon and all the wires are then removed. After an angioplasty and stent procedure, your doctor will likely recommend that you take aspirin and another anticlotting medicine for a duration of a month. These medicines help prevent blood clots from forming in the stent. You should avoid vigorous exercise and heavy lifting for a short time after the procedure. Your doctor will let you know when you can go back to your normal activities. Angioplasty and stents help prevent arteries from becoming narrow or blocked again in the months or years after the procedure. Continuing the lifestyle changes recommended by your doctor can help prevent plaque from building up in your arteries again. You should also take all medicines as your doctor prescribes. Your doctor may also suggest taking statins, which are medicines that lower blood cholesterol levels further preventing the buildup of plaque in your arteries.